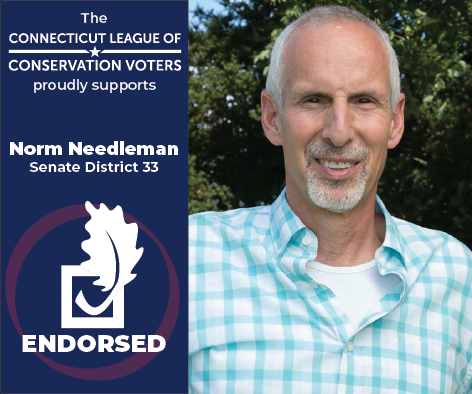 The Connecticut League of Conservation Voters (CTLCV)—a bipartisan nonprofit organization dedicated to protecting our environment by making it a priority for our elected leaders— endorsed Norm Needleman (D) to represent the 33rd Senate District. Needleman is currently serving his fourth term as First Selectman in Essex, where he has been a thoughtful leader on environmental issues. He has taken a strong stance about the importance of combating climate change and investing in clean energy to grow our economy. When it comes to the environment, Ziobron has been in lockstep with lawmakers like Len Suzio and Craig Miner, both of whom ended up on LCV's Dirty Dozen in the States list, which tracks the worst anti-environment state legislators in the nation. We can't afford to risk our environment and our future with Ziobron in the State Senate. Norm Needleman is committed to protecting the values and priorities we share. He signed our Clean Energy for All pledge, vowing to move Connecticut to 100% clean energy by 2050 or sooner. With the latest report from the United Nations saying we only have 10 years to cut emissions and act on climate change before catastrophe strikes, it's clear we need leaders like Norm who are ready to invest in clean energy, creating jobs and shrinking our carbon footprint.